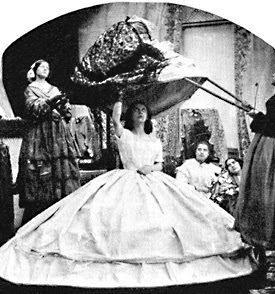 In 1858, hoop skirt manufacturers Douglas & Sherwood placed an advert in February's issue of Godey's Lady's Book and Magazine for their new and exciting "Patent Adjustable Bustle and Skirt" which resembled a giant, upside-down badminton birdie. The hooping was made from whalebone and it became a staple for women for the next 20 years. It equally shaped the idea of fashion, and perhaps helps to developed some of the more structural designers such as Hussein Chalayan, or even Lady Gaga's abstract garments.